Importing large amount of data from DTW may take long time in some cases. If you import over 1000 master data records and over 1000 transactional data records – this article is for you! Starting from SAP Business One 9.2, version for SAP HANA PL 04, you can accelerate the performance of the DTW by leveraging the multi-threaded capabilities of COM+ technology. During this process the import file is divided into several chunks and the data is imported through parallel sessions, thus making the import much faster. As a result, the SAP DI API and COM+ applications are installed. This enables opening multiple COM+ threads and perform more efficient import process. From the user point of view, there is no need to divide the import file into smaller chunks – the system takes care for the parallel processing transparently. We recommend to use this option if you import over 1000 master data records or over 1000 transactional data records. 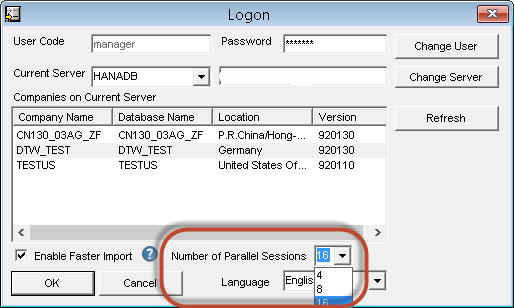 Once selecting this checkbox, you can determine the number of parallel sessions (see the red rectangle in the screenshot), which is actually the number of COM+ threads. The optimal number of threads depends on various parameters, such HW configuration. You can try changing this number and find out which option yields the best results. In general, the more threads, the better performance, but at certain point too many threads may lead to slower performance. As a rule of thumb, four threads usually yield better performance. Over time, additional objects will be supported. This option is available only in SAP Business One, version for SAP HANA and is not supported on MS SQL. I tried this functionality but it´s not faster than the regular option. Probably it could be the HW configuration.